Game Day with Hope Refugees F.C. Myrto Vogiatzi heads to Piraeus to meet a team with a difference. It is a quiet Friday morning and the streets of the Kaminia district, at the heart of Piraeus, are almost as peaceful as on a Sunday afternoon. In between its light-colored flats, some of the older buildings, once used as factories by tobacco workers and shipbuilders, reveal the district’s industrial past and make passers-by reminiscent of a time they never even lived. As I walk down Amorgou Street, silence slowly makes room for scattered noises coming from the football field around the corner, where around 20 players are warming up before their training session. To a casual observer it would appear no different to the hundreds of similar sessions which take place on weeknights at amateur sides across Greece — but this is no ordinary club. 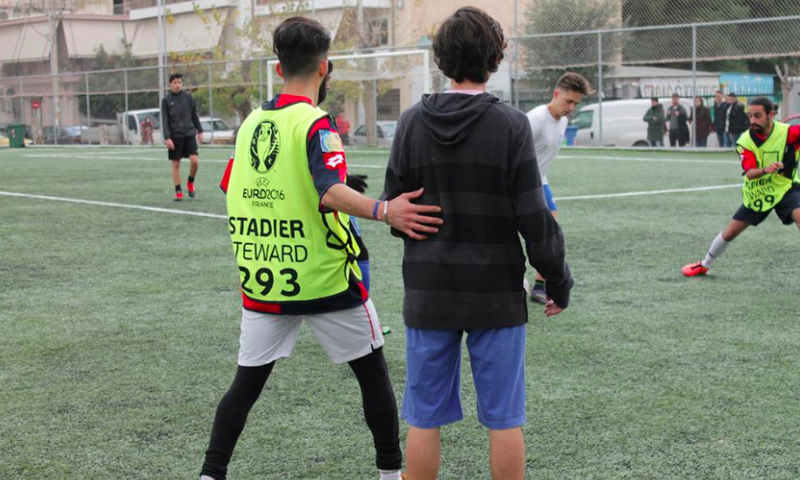 Set up last September by the NGO Organization Earth, the Hope Refugees Football Club is exclusively made up of refugees and asylum seekers between 18 and 26 years old. “We had already set up football teams at the Skaramagas and Sounio camps, but we soon realized that we needed to offer the same opportunity to refugees living outside of the camps”, says Katerina Salta, Executive Director at Organization Earth, during a Skype interview. “So we decided to approach not only refugees staying in camps near Athens (Skaramaga, Elliniko, Shisto and Eleona) but also those living in occupied spaces and common flats”, she adds. Partly financed by the UEFA foundation, the aim of the program is to better integrate refugees living in Athens and provide them with creative skills or help them develop already existing ones. With their blue studs and yellow jerseys, I have to say that the Hope Refugees team looks much more stylish than I expected. They’ve been warming up for a good half-hour and are now more than ready to face their opponents, a local high school team that has agreed to train together for the day. Time for introductions is short and a few inquisitive looks from both sides are enough of a greeting before the ball starts to roll. Am I supposed to take sides? Probably not. But I still catch myself bouncing with excitement every time the team scores a goal. Sitting next to me, the team’s doctor, Tania, makes the bench groan even more by jumping to her feet every five to ten minutes. “Our boys are calm. I’ve never seen them being aggressive when they play. And if they need my help it’s usually for simple things, like an ankle sprain or a small fall. I have this thing about goalkeepers though…when they fail to catch the ball they often fall down and lie there without moving, which freaks me out!”, she explains. It’s been nearly four years since Tania first started working for football clubs and she has had her fair share of balls thrown in her face. “Never on purpose though!”, she points out playfully. The whistle blows; it’s halftime. With a score of three to two in favour of the Hope Refugees team, it’s time for a break and a bit of showing off to three schoolgirls walking past the field. A dribble or two seem to do the trick, and, soon enough, a new audience of giggling admirers is drawn to the fence. A bit further away, some players are mercilessly pouring water over their head, in an effort to cool off. “Cold Ali, cold!” shouts Tania to a player standing in front of her. At only 22 years old, Ali, from Syria, is also the team’s manager and helps organize the training sessions every Monday, Wednesday and Friday. Since mid-December, the team has also been competing in the ESEA tournament for amateur football leagues and holds a respectable record of three wins, two ties and two defeats. “From the moment we first started, four of our Syrian players have left us — three for Germany and one for Belgium — and now others are getting ready to leave as well. This means that the team’s structure changes constantly and we’re often looking for new players”, says Nikos Delagrammatikas, communications officer for the Organization Earth and reporter for the popular Olympiacos football club. Their newest addition is Ahmad, from Afghanistan, who joined the team just a few days ago. Ahmad arrived in Greece in early 2016, after death threats from the Taliban forced him to flee his hometown, Kabul. “When I was 11 years old I started working as a translator for the American Embassy there because my English was good and because my dream was to go, one day, to the United States. I used to spend half of my time at school and the other half working for them. But when you work for foreign people in Afghanistan, especially Americans, you are constantly targeted, so I had to escape”, he says. Ahmad’s boat capsized, however, while he was trying to cross the Aegean Sea on his way to Europe, and he lost his most important possession: his passport. Unable to get any help from the American Embassy in Greece, he applied for asylum here, while living in a tent at the Malakassa camp. Since then, Ahmad got engaged and moved to a flat with his fiancé and mother-in-law, in the centre of Athens. He also spends his time learning Greek and teaching English for the Farsi speakers at the Orange House, in Eksarhia. But his biggest passion has always been football. “We didn’t have many fields in Afghanistan so we were renting one field for around 55 euro per match. I could afford it because I earned quite a lot of money”, he says. “You know, maybe for some of these players here football is just a game to help pass the time. But for me it’s like a dream”, he adds, in his near-perfect English, his eyes fixed on the field. Looking at him sitting on the bench next to me, it’s hard to believe that Ahmad is only 19 years old. There’s a maturity in his ways that doesn’t seem to quite fit; as if maturity had come in a few big waves rather than many small ones and would be gladly pushed away if possible, along with all of the painful memories that brought it along. A few moments later, the game is already over, with a score of five to two in favor of the Hope Refugees team. A wide smile spreads across Ahmad’s face as he jumps to his feet in order to join the rest of the team. Handshakes and high fives are in order while both coaches congratulate the players. Amongst them is Simon, the team’s 26 years old goalkeeper from Uganda. Unlike the rest of the team, Simon is a professional footballer, having already played for the Uganda Premier League in the past. He came to Greece in 2015 and currently shares a flat with a friend near Attiki metro station, while picking up a few jobs here and there. “I would like to continue playing football but I’m not sure if I’ll be able to keep training with the Hope Refugees team because I’ll probably have to work every Sunday from now on”, says Simon, who joined the team a few weeks ago. “Football needs concentration and it’s not easy when you’re trying to survive at the same time”, he adds. “Aren’t you coming for lunch?”, says suddenly a voice to our right. It’s Lupa, the team’s youngest player who soon makes me realize we’re the only ones left on the field. Everyone else has already gone to the restaurant across the street, which serves meals provided by the organization Earth after every training session. Giouverlakia’, a Greek meetball soup, is on today’s menu. “Please, join us for lunch, you’re our guest here!”, says one of the players and brings me another chair. Myrto is a journalist based in Athens, Greece, having previously been based at L’Orient-Le Jour in Beirut, Lebanon. She has contributed her work to publications in France, India and Greece, and in particular focuses on sociopolitical issues, developmental issues and international relations.